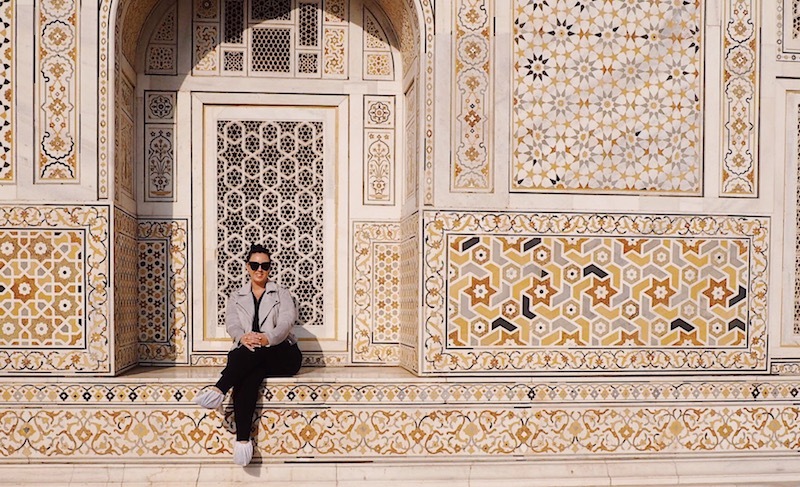 This post is part 2 of my review of the G Adventures Agra Independent Adventure and covers what else we explored in Agra after visiting the Taj Mahal. I’d definitely recommend staying in Agra rather than doing a day trip to the Taj Mahal from Delhi. This post explains why. I needed some time to digest my visit to the Taj Mahal while filling my belly with good curry and luckily Naveem had just the place. After checking into my hotel, another well-kept and well-priced property with flower-lined corridors, Naveem took me to a place he says all his clients love, Golden Street Restaurant. I ordered my favourite dish, a chicken korma (don’t judge me) and then went to town with rice and roti too. Everything, including the Tiger Beer, was perfect but having overestimated the portions I found I had a lot left over. 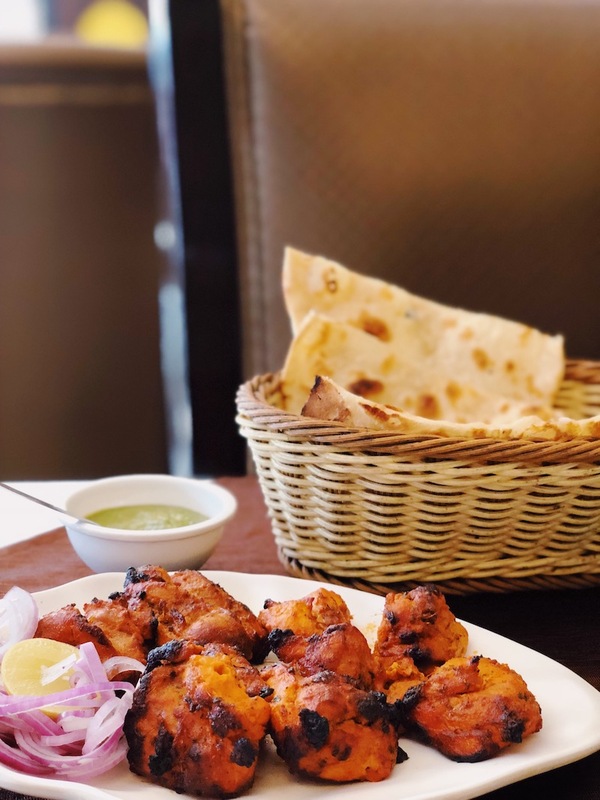 Without asking, the waiter bought me the bill without the rice on it, ‘You did not eat much so we discounted the bill.’ I went back the next day for Tandoori. I slept well after the excitement of the Taj visit (or maybe it was all the curry) and then met with Naveem and Pramod the next morning to continue exploring Agra. Is Itimad-ud-Daulah nicknamed the Baby Taj as tourists have no idea how to pronounce the real name? 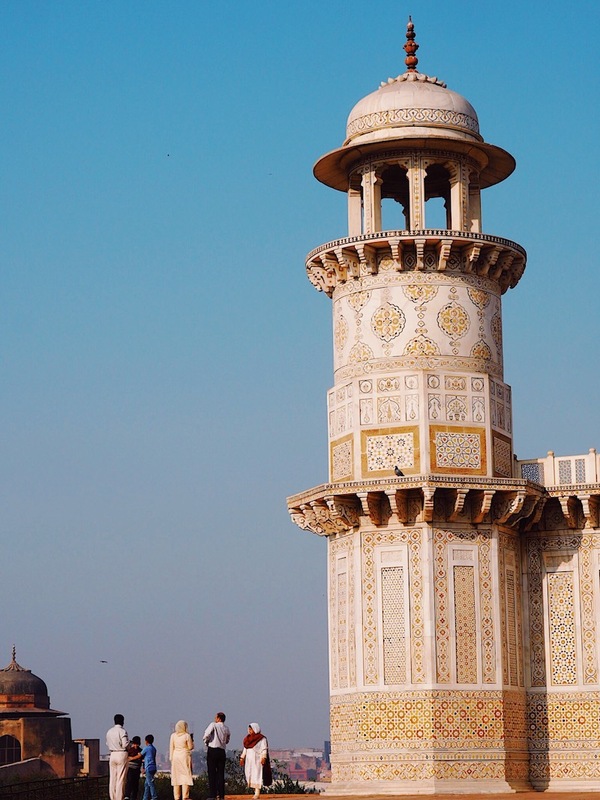 Our first stop was Itimad-ud-Daulah, the first Mughal tomb fully made from marble, which has earned itself the nicknamed of the Baby Taj Mahal due to the similarities between their gem-dotted exteriors. If you ask me, though, the moniker doesn’t quite do either building justice. I was glad to have Pramod on hand to explain who exactly this mausoleum was made for. 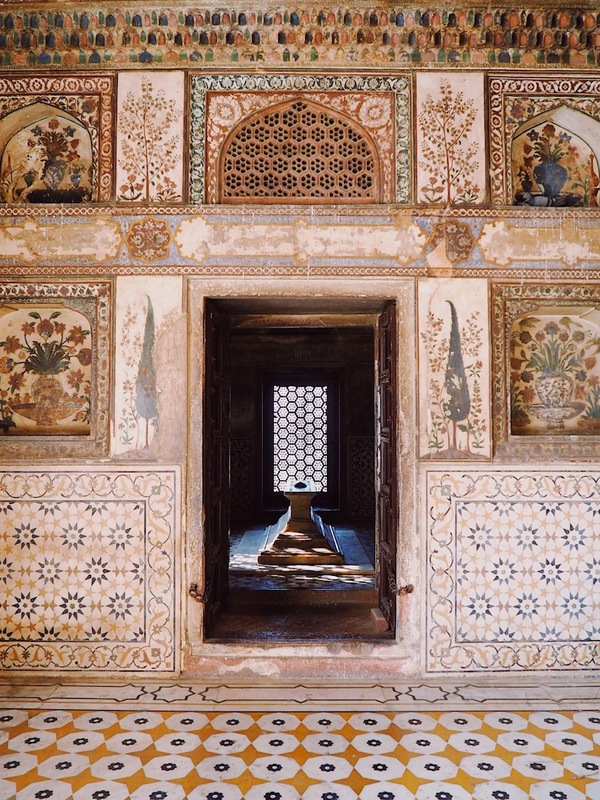 It can be hard for a first-timer to wrap their head around who all these Mughal rulers with such elaborate resting places are, but I shall try and keep this simple for you, just as the guide did for me. 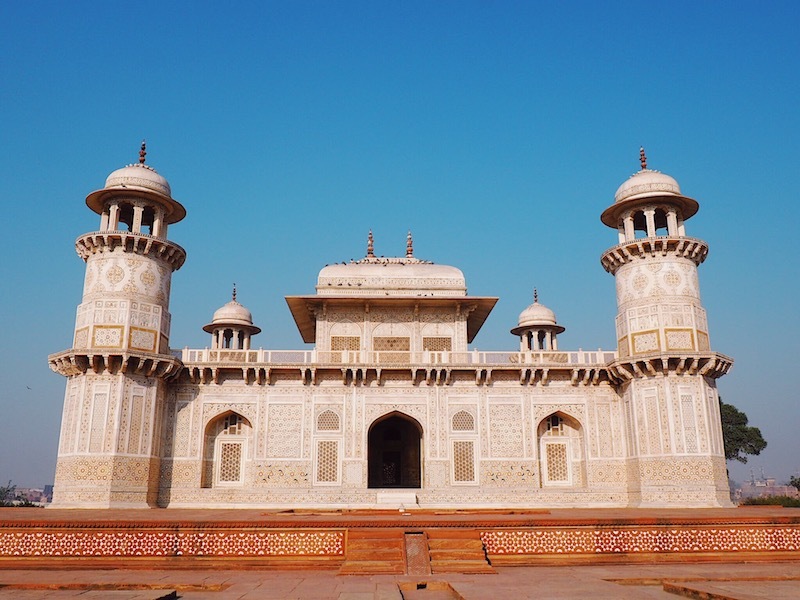 When Itimad-ud-Daulah died in 1622, Nur Jahan commissioned this tomb for her father based on a similar style tomb she had built for her husband Emperor Jehangir. She did her father proud because it’s an absolutely stunning jewel box of precious stones and delicate mosaics. 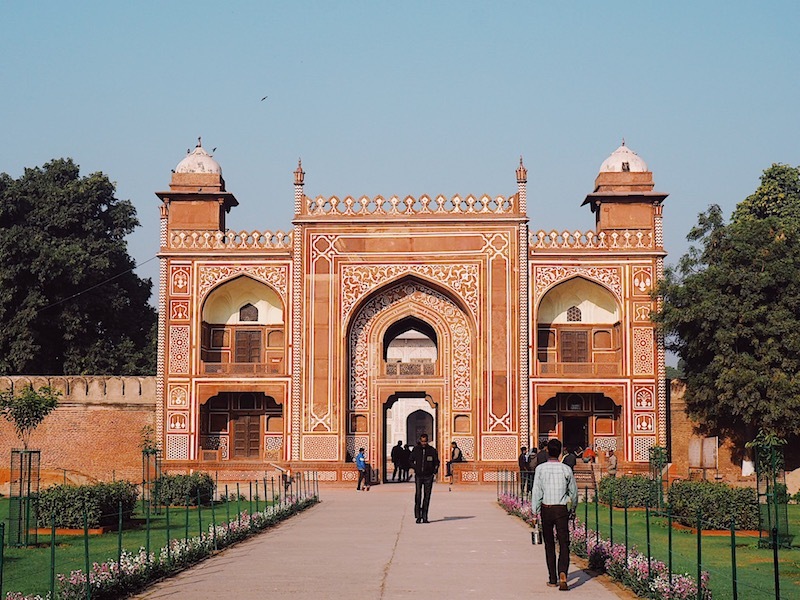 The beauty of visiting Itimad-ud-Daulah is not just that you can get your head around the Mughal royal family but that you can walk inside this tomb (where many of Ghiyas’ family are buried) relatively peacefully as it gets a tiny fraction of visitors compared to its larger cousin. There is also work being done to the gardens surrounding the tomb and I like to think that in coming years the whole grounds will look like the special resting place it was designed to be. 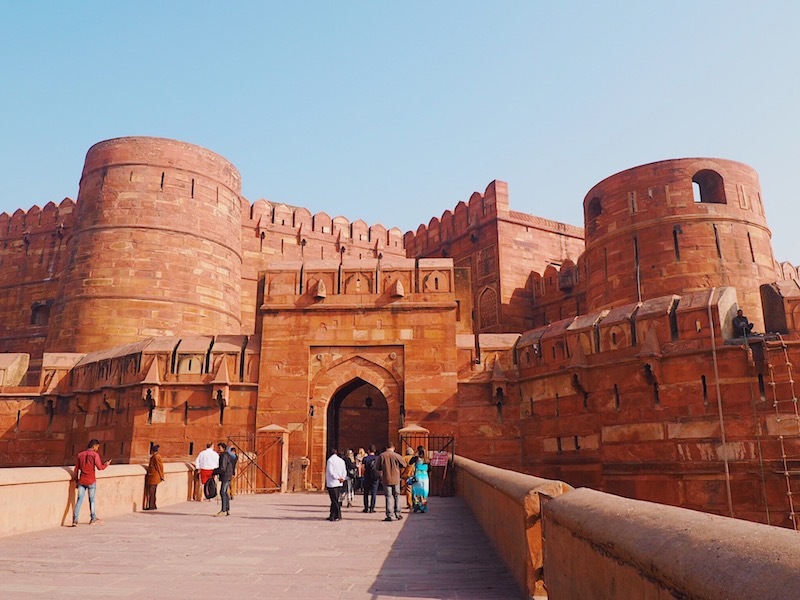 Also on our must see in Agra list was the Agra Fort, which grew from being a military fort built by Emperor Akbar in 1565 to become the main residence of the Mughal Emperors until 1638, when the capital was shifted from Agra to Delhi. This UNESCO World Heritage site, often overshadowed by the Taj Mahal, is an incredible combination of imposing gates, sandstone pillars and marble palaces. With Pramod showing me around and pointing out remnants of the clever cooling systems and rings that once held curtains, I could just imagine what a sublime residence this must have been. 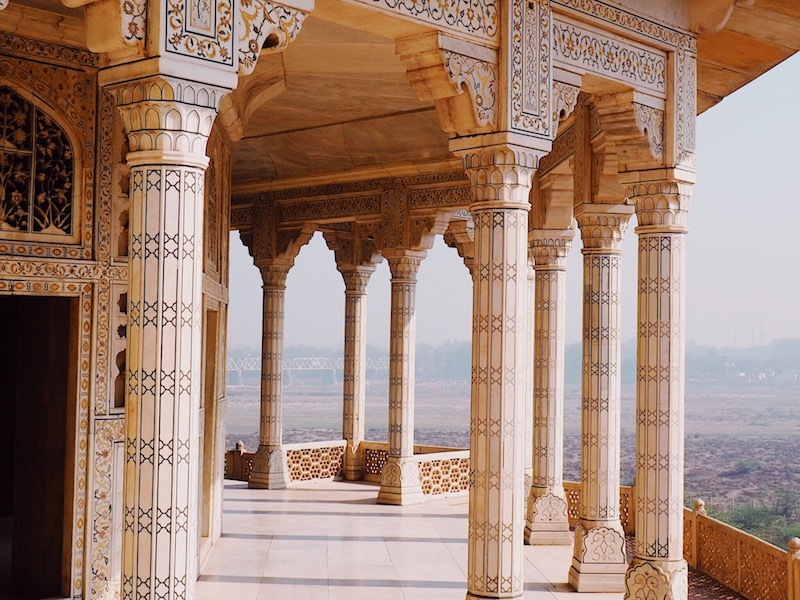 The balcony Shah Jahan is said to have spent his last years…. Not everyone had a sumptuous time here though as the Agra Fort became a prison for Shah Jahan in his later years as his despotic son put him under house arrest here. Aurangzeb seized power in 1658 and imprisoned his father in the fort’s octagonal tower, which has views of the Taj Mahal. The story goes he spent his last days on the tower’s verandah staring forlornly at the Taj Mahal he’d built for his beloved Mumtaz. 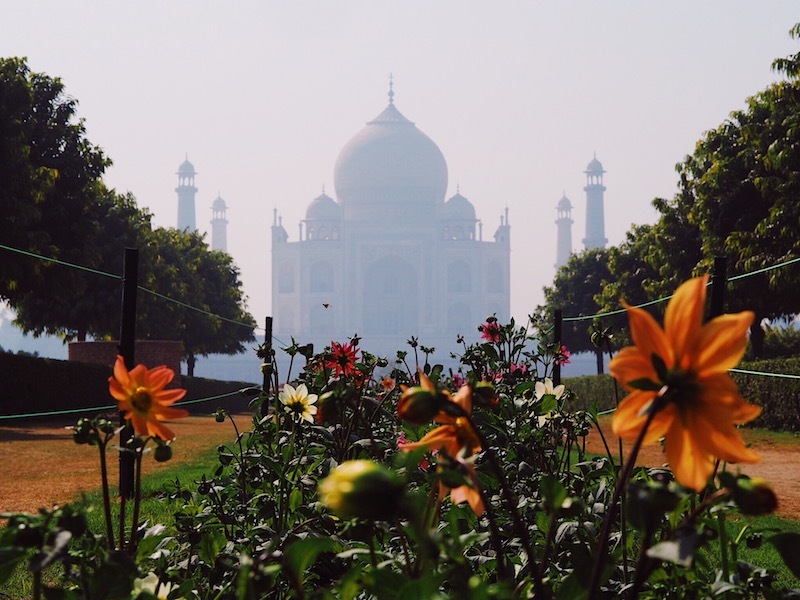 The gardens are just across the Yamuna River from the Taj Mahal and work is being undertaken at the moment to fill them with exotic flowers and fountains as they would have been in the 1500s. 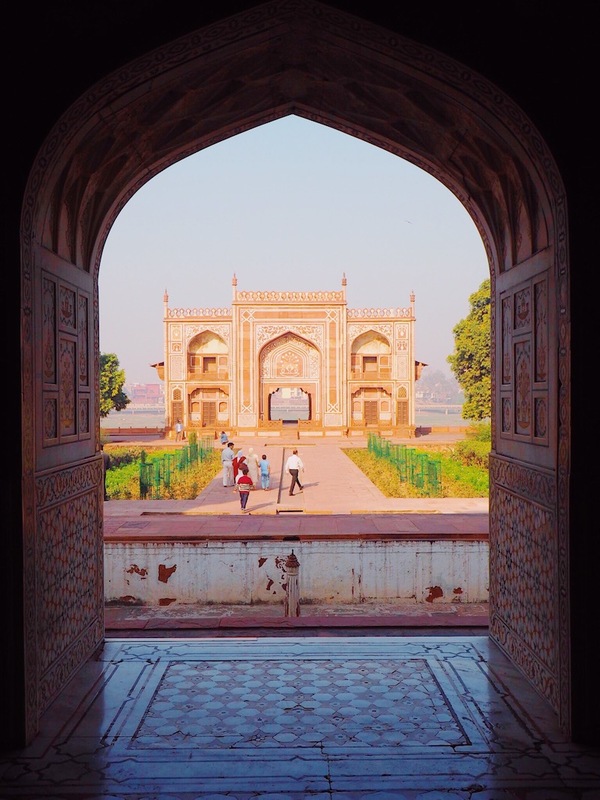 Whether the ruins at the water’s edge are the foundations for Shah Jahan’s Black Taj Mahal or not, it cannot be argued that Mehtab Bagh is one of the most scenic spots to admire the Taj Mahal. As I stand in these ruins I feel a strong connection to Agra’s history. 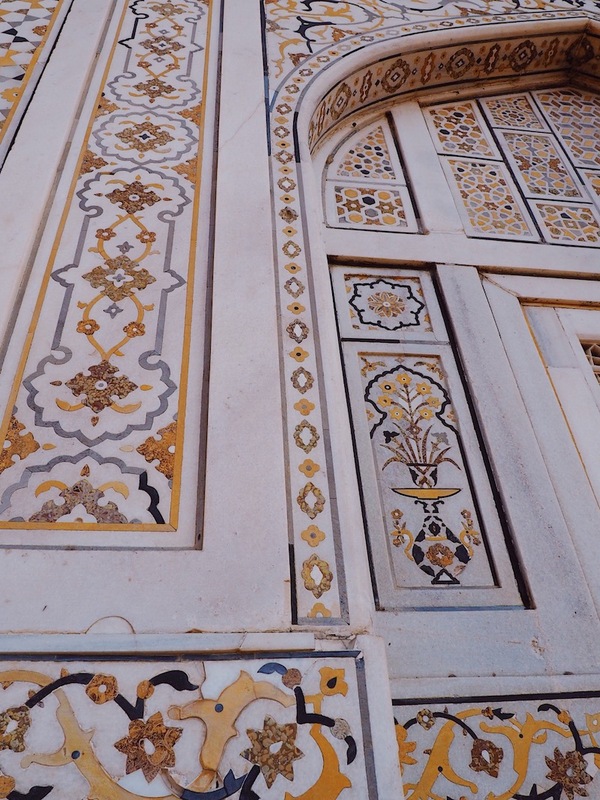 You can read stories of mega-rich Shahs, marble palaces and gem-encrusted mausoleums and they seem almost like fables. Coming to Agra made history real for me. 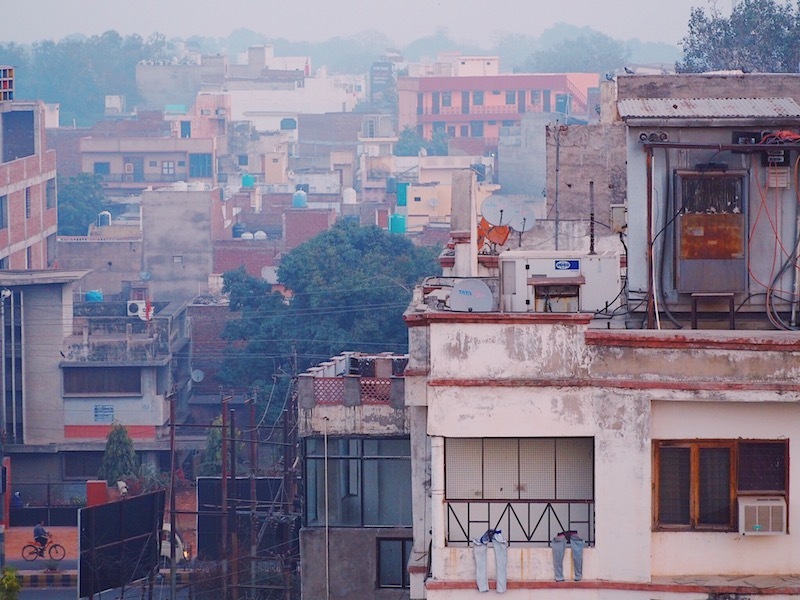 I learned about far more than buildings; I connected with India’s ancient rulers. 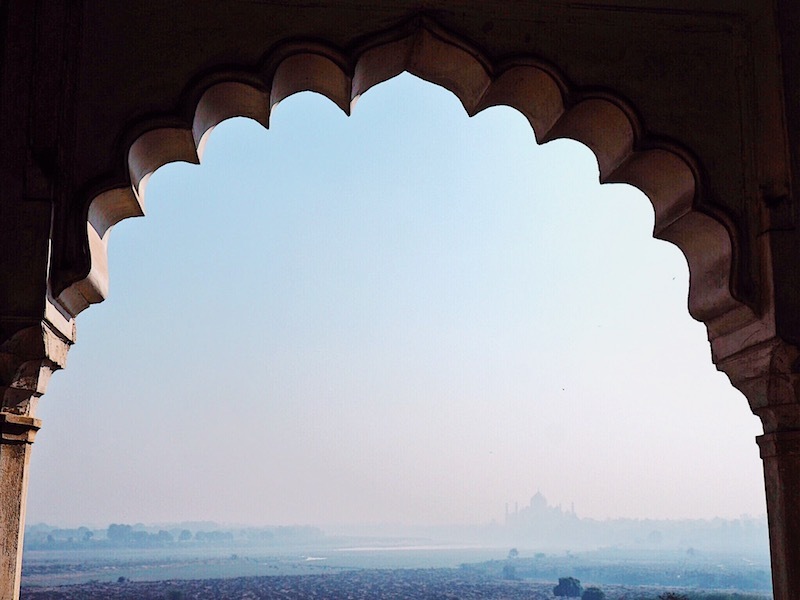 I explored Agra on the Agra Independent Adventure with G Adventures. Prices start from $499 per person for 2 travellers. Accommodation (in 2 very clean & comfortable 3 to 4 star hotels), transport, entry fees & guides are included. Meals and tips are extra. I travelled as a guest of G Adventures, all opinions are my own.